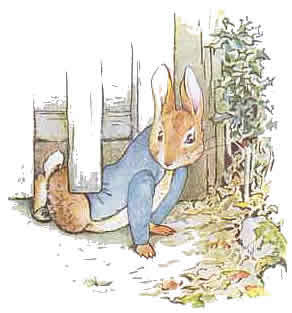 Today’s post has been inspired by The Tale of Peter Rabbit by Beatrix Potter. Before I had children of my own, I was of the opinion that Peter Rabbit was kind of a brat. He didn’t listen to his mother, got himself into trouble, lost articles of clothing, and left messes for someone else to clean up. Then I had my own “Peter Rabbit” kind of child. With my highly impulsive son, I saw similarities with the little rabbit who didn’t listen and got into preventable and unfortunate situations on a regular basis. Even my daughter who is 15 months younger than my son recognized at an early age some unfortunate parallels from the Peter Rabbit story and our own family. Being the compliant, “neurotypical” child, she identified with Flopsy, Mopsy, and Cotton-tail, who are described as “good little bunnies” who follow directions and do what they are supposed to do. As a side note, if all of my children had been like Beth, I would probably be giving parenting workshops at conferences instead of the topics I currently present for struggling learners. I also have a sinking feeling I would be judging all the parents with kids like mine! So God spared me from myself by humbling me with my challenges. In The Tale of Peter Rabbit when I would get to the line, “But Peter, who was very naughty, ran straight away to Mr. McGregor’s garden, and squeezed under the gate!”, Beth would say, “Just like Josh, right?” At this point, Josh would sigh, but I think he was secretly rooting for Peter to somehow be able to get away with it this time. Now, before we judge little Peter Rabbit too harshly, let’s consider a few factors that may be in play in his situation. Peter may have inherited a tendency for some of his behaviors, since we are told his father “had an accident” in the very garden Peter ran to as soon as his mother left for her errands. Plus, there is mention of a cousin who apparently has had a run-in with cats. There is a family history implied here. Now, consider the lack of strategies throughout this scenario. Did his mother get his attention before giving her instructions? No. Aren’t her directions long and wordy, making it more difficult to process them? Yes. She didn’t have Peter repeat back what he’d heard to make sure he understood it. Even her parting words, “Now run along and don’t get into mischief” seems almost like an expectation of trouble to come and puts a negative tone on the situation. Peter may have stopped listening after “Now run along…”. All things considered, it doesn’t sound like a good idea to leave Peter alone! How irresponsible of Mrs. Rabbit, come to think of it. Her approach works with her other bunnies, but Peter clearly needs more support. So now I’ve gone full circle from thinking Peter is a brat to defending him, and I know it’s because I’ve felt protective of my oft-misjudged son. At the end of the story, when Peter makes his way home and is dosed with medicine and sent to bed, his sisters get to have a treat of bread and milk and blackberries for supper. The “good little bunnies” get the reward. My pre-Josh attitude was “Serves Peter right! He made bad choices and maybe this will help him learn to do what he’s told next time.” Now, I think if I were Mrs. Rabbit I would hold back some of the yummy blackberries to make sure Peter got to have some when he was feeling better the next day. And as he was eating them, we would talk together about what had happened and how to do things differently in the future. I would reassure him that I loved him just as much as I loved his sisters, and tell him he was every bit as special as they are to me. My advice is, if you have little Peter Rabbits in your life, love them. Support them. Teach them. Teach them again when they forget. And when people give you a look or misunderstand your child, remember that they are probably not blessed with a Peter Rabbit of their own and don’t understand because they haven’t experienced what you have. And then love your Peter Rabbit some more.